At 1500 on April 3, 1945, Flight Petty Officer 2nd Class Tamao Murata took off from Kanoya Air Base in a Zero fighter carrying a 500-kg bomb and died in a special (suicide) attack south of Amami Ōshima at the age of 19. He was a member of the Jinrai Butai (Thunder Gods Corps) 2nd Kenmu Squadron. He was from Kyōto Prefecture and was a member of the 1st Toku Otsu Class of the Navy's Yokaren (Preparatory Flight Training Program). After completion of training, he became a member of the 721st Naval Air Group. This must make you surprised. You have carefully watched over and taught me up to today, but I regret that I never repaid any of your kindness. When I remember you who did this for so long, my kind older brother, and my older and younger sisters , my resolve wavers. However, no matter how many my concerns, the number is not that great when compared to the heart of the Emperor who has had a countless number of children snatched away in this sacred war. Even though this body will end up in a foreign sea, please commend me and do not cry. When you remember me, see me in the skies. There certainly you can view my figure in the shadow of my plane flying through the skies. Finally, as a request to you, have a long life by not straining yourself. Older Brother and Sisters, I ask that you show filial piety to our aged mother to take the place of my share. The letter comes from Matsugi (1971, 187-8). 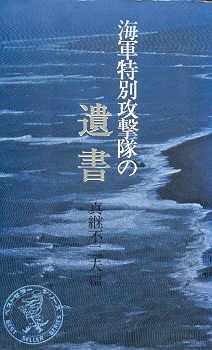 The biographical information in the first paragraph comes from Matsugi (1971, 187) and Osuo (2005, 194). 1. The Japanese word (shimai) can indicate either one or more older sisters and one or more younger sisters.